In my experience the open road leaves no shortage of time to talk, listen, argue, laugh, and to get to know your fellow travelers a bit better - much is true for the cast of characters journeying to California in their bright yellow VW Microbus in Little Miss Sunshine directed by Jonathan Dayton and Valerie Faris. At first glance it's easy to dismiss. You'd assume from the previews that the characters are sufficiently quirky, deliver sharp one-liners on cue, and ultimately see the error of their ways to reform their flaws by the closing credits. While the formula may be recognizable, in actuality this refreshing dramedy allows its subjects to remain wonderfully flawed in an effort to explore just how bold you have to be to embrace your own diversity. 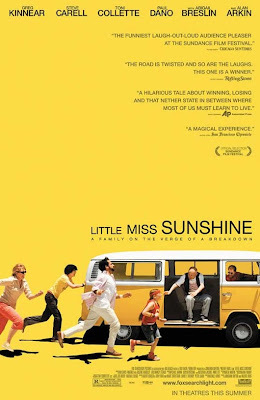 To me Little Miss Sunshine embodies a simple honesty making it easy to digest while still giving you something to sink your teeth into. On a road trip to the Little Miss Sunshine pageant we're taken on a journey of weakness, uncertainty, and realization, covering all our bases with the mash-up of personalities along for the ride. But the drive of the movie, quite literally, is a story about finding comfort in your own skin and pushing through the unexpected speed bumps - bumps that are potentially too heavy to handle alone. From a mother's inability to keep her family focused, a son's dashed dreams, or a father's struggle to live up to his own words, the characters in Little Miss Sunshine all have a common awareness of their limitations. Although there's no clear cut resolution or easy answer to any of their problems, it's through brief moments of clarity that they each begin to see that the lives they lead are of value to those around them - the domino effect of these discoveries only helps to broaden the story in addressing the universal nature of their woes. They're messages we've heard over and over again: be happy with what you have, be happy with yourself, love, accept, share . . . and these are tough sentiments to crack. But, those messages are developed in Little Miss Sunshine in small gestures; a supportive hand on a shoulder, a few kind words, simple expressions, and moments of silence. A slow drive provides the perfect backdrop for the solace and reflection required. The movie says everything you want to hear without much glorification, political correctness or grandeur. It's about underdogs that you feel for, relate to, and believe in. On screen it feels genuine. On top of all this (thankfully) it has a comedic sense that encourages you to laugh at everyday life and those little occurrences and slip ups that when personally experienced we only find the humor in after the fact. Mind you, if you've actually seen anything like the climax of this film in reality you're probably in a more select group than the rest of us. We can continue to dream though. The characters are twisted, but not overbearing; they're outcasts, but they compliment each other perfectly. It's a combination that clicks perfectly into place making it fun to watch time and time again. In an optimistic euphoria, Little Miss Sunshine is a bit of reassurance that no matter who you are everything is going to be alright - I for one believe it's true. We should all be so lucky to discover our own 'Super Freak'.